Not long after mastering the art of making tinctures with herbs, I started acquiring quite a supply of little herb-infused-alcohol on my shelves. What to do with them? I know you can add tinctures to body/beauty products like creams, lotions, body scrubs, facial toners etc. Also, you can use them as part of your kitchen first aid kit. But with my love of food, I wanted to find a more tasty way to use the tinctures. Enter Rosemary Gladstar. Her book is brilliant if you’re inspired by Harry Potter’s Potions class, and want to start concocting things in your own kitchen. Damiana is a restorative herb that is a gentle anti-depressant, helps you deal with stress/anxiety, and is also supposed to be an aphrodisiac! Sounds perfect for an after dinner drink. The key with liquors is that they just take time. Letting them steep and mellow really improves the flavor. Also, I learned again that packaging is SO important. Straight out of the measuring cup this was tasty … but once I bottled it nicely, and added a name and a label, somehow it just tastes better to me. Yikes, I’m really a child of the advertising age! Soak these same leaves in the water for 3 days, strain and reserve the liquid. Over low heat, warm the infused water and stir the honey in until it’s dissolved. Remove from heat, add infused alcohol. Add a splash of rosewater and vanilla extract. Pour into a clean, pretty bottle (I usually fill bottles with boiling water for a few minutes first, as a sort of semi-sterilization). Label the bottle. Let it sit for one month or longer, for the flavors to develop. To serve, take 1 cup of liqueur and add 1/2 cup of chocolate syrup and a splash more rosewater. Serve in little cups straight or over ice. Yum! Being lazy, I mixed the entire bottle’s contents of liquor with the syrup and rosewater at one time, and then rebottled it. I think I decreased the shelf life of the liquor by doing this – will let you know! The liquor mix (without chocolate syrup) should last quite awhile, at least a year. Have you tried making flavored liquors at home? I invented a few more that are still steeping, will share the results soon (a hawthorn berry and cinnamon in vodka, and another with dandelion and burdock in brandy). Happy experimenting! 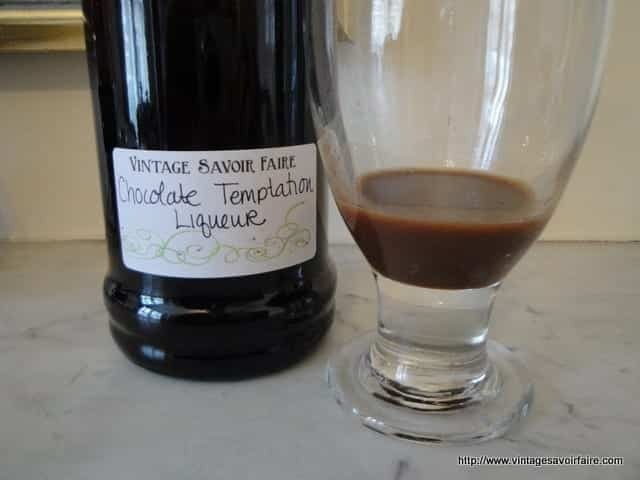 I’m trying this recipe right now from Mary Gladstar’s book and was wondering as well about mixing the chocolate syrup right in to the alcohol mix. Did you find it shortened the shelf life if your liquor at all? I’ve seen some homemade recipes online for basic chocolate liquors which seem to use the same method as you put above. Just wondering what your outcome was like! Hi Colleen, I wondered about that too, but we had the liqueur for about a year and it was fine the entire time. I used store bought chocolate syrup though. If you do try making your own chocolate syrup, let me know how it turns out! Enjoy the liqueur, it’s yummy! Nicki, I love the idea of making vanilla extract, I use that all the time for baking! I agree with you that the flavors can be pretty basic in liqueurs. That’s one reason why I liked this chocolate recipe, because it includes a bit of almond and rosewater to make it a little more complex. For Christmas last year I gave away small bottles of homemade Vanilla Extract as well as medium sized bottles of Vanilla and Raspberry Vanilla Liqueur. The production process was somewhat simpler than what you describe and I’ve had quite nice results, although the Liqueurs tasted a bit boring to me. The method was simply letting Vodka, Vanilla, rock sugar (and thawed frozen raspberries) steep for a couple of months. The sugar dissolves completely and the Vodka turns a nice light brown (or red, respectively) color. For Vanilla Extract just leave out the sugar. I’m trying this one this week! Yay! Thanks for the recipe!